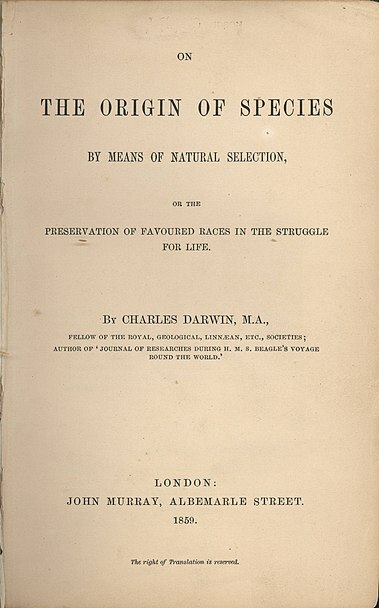 Pictured above is the title page of Darwin's first publishing (in 1859) of On the Origin of Species (left), Darwin's 1837 notes (center), and Charles Darwin (right). 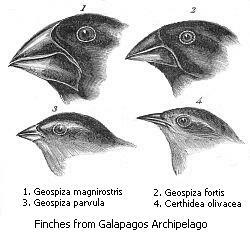 Students know both genetic variation and environmental factors are causes of evolution and diversity of organisms. Students know the reasoning used by Charles Darwin in reaching his conclusion that natural selection is the mechanism of evolution. Students know how independent lines of evidence from geology, fossils, and comparative anatomy provide the bases for the theory of evolution. Students know that extinction of a species occurs when the environment changes and the adaptive characteristics of a species are insufficient for its survival. 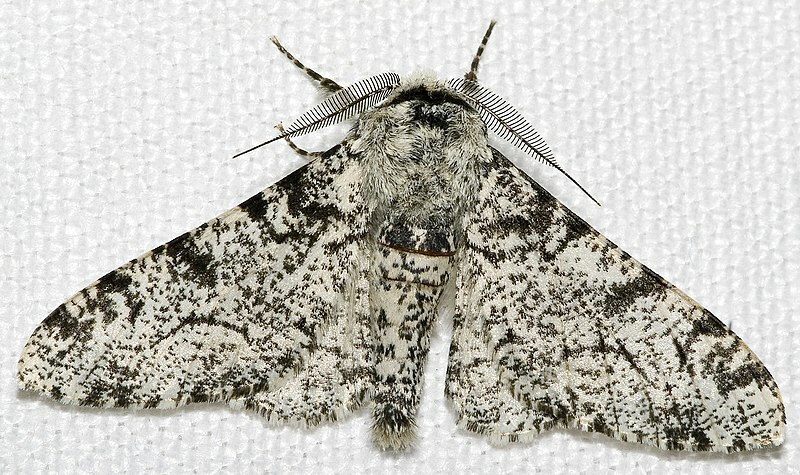 The Peppered Moth (Biston betularia) depends heavily on camouflage. In this lab, you will use a computer simulation to track a population of organisms as they evolve. 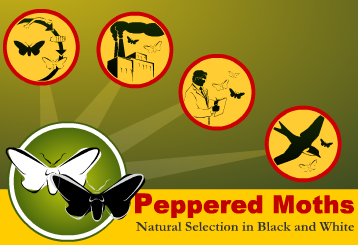 You will take data on the number and varieties of the organisms and graph them to show change over time and determine how two factors, MUTATION RATE and SELECTION STRENGTH affect how populations evolve. 2. Read the introduction and the contents to learn about the imaginary creatures you will be studying and how to operate the simulator. You may also want to look at the help link. 3. 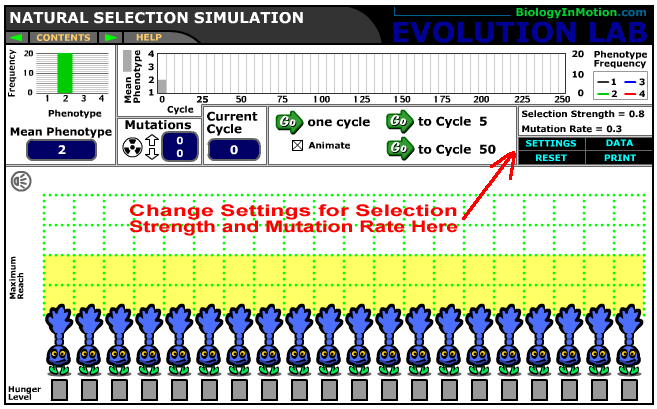 Answer the introductory questions on your Evolution Simulator sheet. 4. Open the simulator and practice using the controls before you go on to the real simulation. Be sure to "reset" the simulator when you're finished practicing. 5. 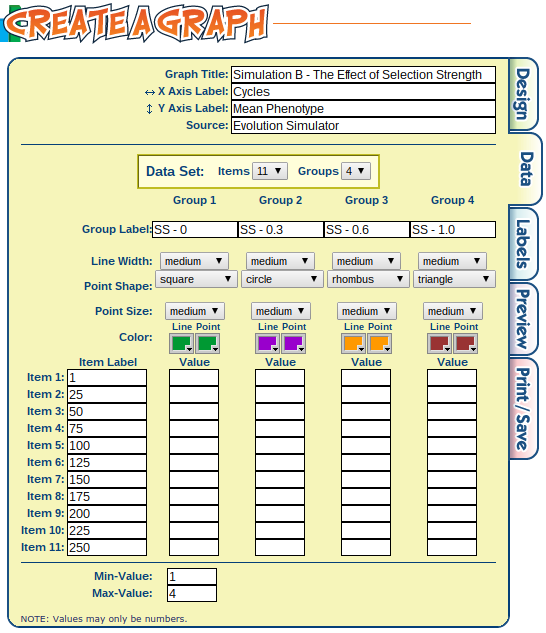 Perform two sets of simulations, complete the data table and create graphs. Clicking HELP gives you a tour of the simulator by providing explanations of all its parts. Simulation A - The purpose of this simulation is to determine how the mutation rate affects the evolution of your population. You will need to run 4 trials with varying settings for mutation rate (see data table). Keep selection rate constant (do not change) at 0.8. 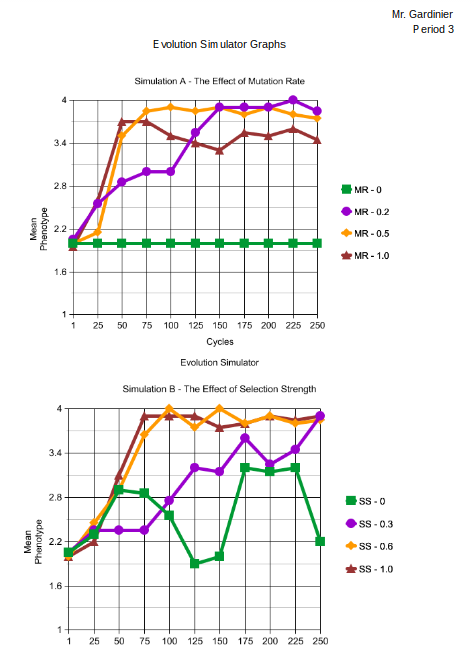 Simulation B - The purpose of this simulation is to determine how selection strength affects the evolution of your population. Run four trials with the selection strength at varying ranges (see data table). Keep mutation rate constant (do not change) at 0.3. 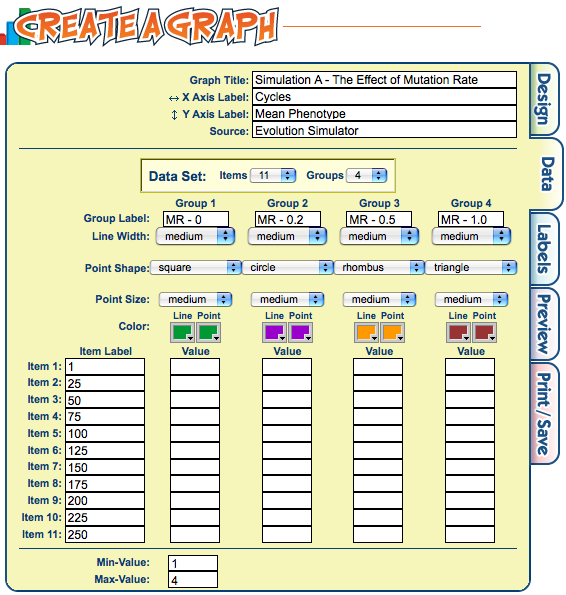 Fill out the data table then you are ready to create TWO graphs. Select LINE graph then use the below image to setup your graph. Enter YOUR data. Above shows how I setup my graph for Simulation A. MR stands for Mutation Rate. Before starting the next graph, move this graph to a Google Doc. Open a new tab and go to your Google Drive or Docs. Create a new document. Name your document like this "First Name Last Name Period Evolution Simulator Graphs" For Example: Clark Kent Period 3 Evolution Simulator Graphs. On the new document, put your name and period at the top of the page. 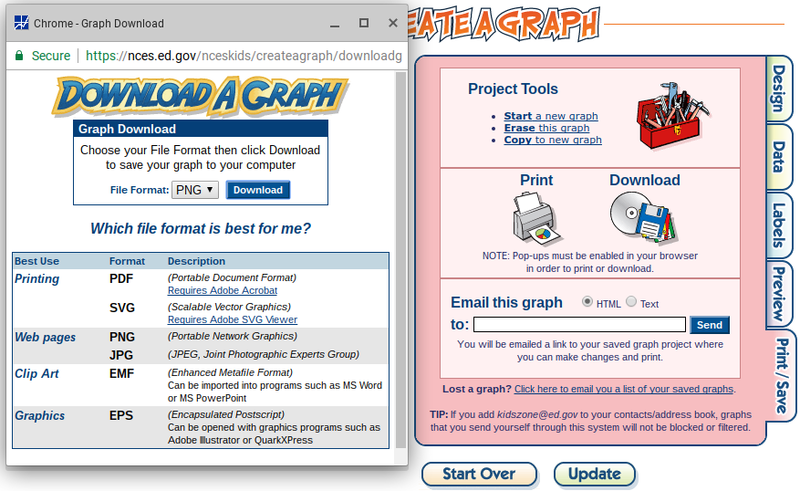 Now, go back to the graphing tab and select Print/Save. 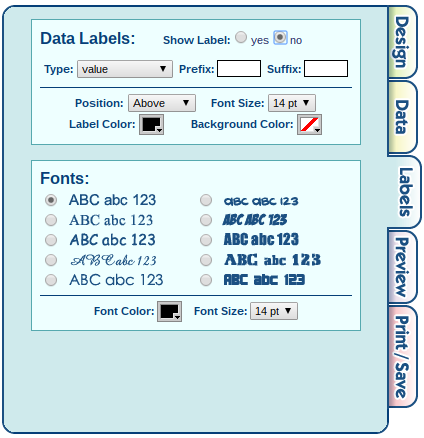 Click on Download and then select PNG as the file format. Then click Download. This adds the graph to your Chromebook's clipboard. Use the below image to see how this should look. After you have downloaded go back to your Google Doc tab. Next go to the menu Insert -> Image -> Upload -> Choose an image to upload. Your graph should be at the top of the list. Select your graph to insert it in the doc. Your graph should now be on your Google Doc. Now you are ready to make the graph for Simulation B. There are some items you need to change so pay attention to the below image! Above shows how I setup my graph for Simulation B. SS stands for Selection Strength. Follow the same steps to insert the graph for Simulation B in your document. Be sure that BOTH graphs will fit on just ONE page. You may need to slightly shrink them so they fit. This is VERY important to reduce paper. It should look like this example below. If it looks similar to the example above, share the document with your teacher. 6. Last, complete the very important analysis questions on the front of the sheet. You will need to look at your graphs so keep your document open. Ask neighbors or your teacher for help when answering the questions. You will need to understand the graphs in order to answer the first two questions well.